Adopting a new pet is always exciting and when you add a new kitten full of energy and curiosity to your family, you will want to have a few things ready for their arrival. Pets, much like children, are an absolute joy and bring so much love, laughter and sometimes, of course, a little chaos to your home. I have three cats, each with their own personality and can’t imagine our family without these quirky furballs. 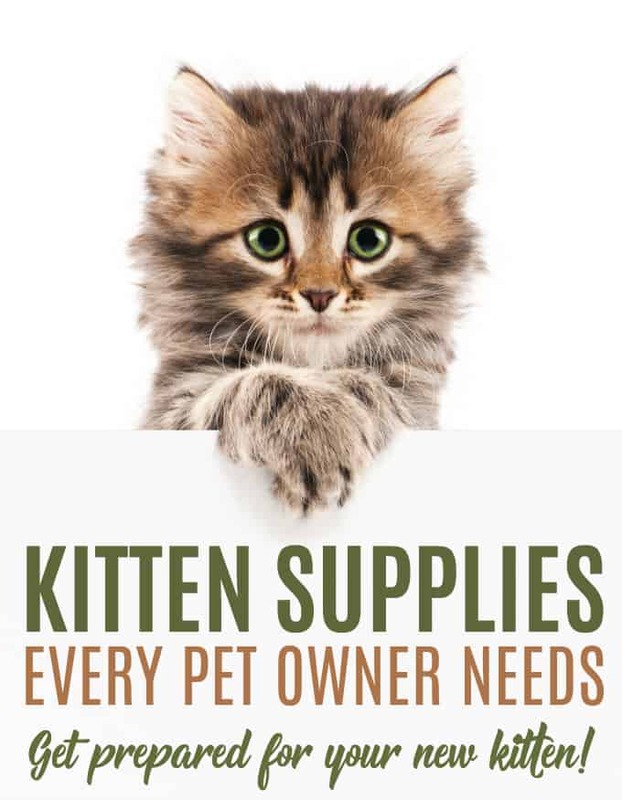 Getting ready is part of the fun and I have put together a list of cat and kitten supplies you will want to find before bringing them home. I first fell in love with a feline back in high school when a little orange and white stray was hanging around our place one night in the cold November rain. “Cheesy” was my roommate through the college days making me laugh when she would jump off the couch and slide across the coffee table on her belly and then run up to do it again. My first apartment was pretty chilly and I loved how she would purr and cuddle up with me at night. We had 18 years together and her picture still hangs on my wall as a reminder of our special bond. After she went to heaven I sure missed her, but knew I had loved her all her life and that I still had more love to give. I made my way to the shelter to find another companion, but this time I had lots of experience about providing a great home. The following kitten supplies are essentials to have on hand. 1. Cat Carrier. I remember the sad little cardboard carrier the shelter provided for “Sunny”and how his paws poked out the holes on the way home. He had no idea that he was headed for a life of luxurious sunbathing in our picture window. Having a carrier to get them home is one thing, but it is especially important for getting your kitten to the vet for their initial vaccinations and follow up appointments. One good thing about getting a cat or kitten at the shelter is they usually have been vaccinated in preparation for adoption. 2. Litter Box, Cat Litter and Scooper. When you gotta go you gotta go and you will want to have a designated spot for them to do their business. Experts recommend having one litter box per cat so naturally I have three of them. You will want to place your new kitten right in the litter box when they first arrive so they know exactly where it is. Most of them already understand exactly what it is for and will immediately paw around in the sand. I prefer clumping litter, but whichever you choose it is important to scoop it regularly to keep odours down. I think of how disappointing it is to find an unflushed toilet and scoop my boxes daily. I also keep it in the basement out of sight which guarantees some privacy and exercise as they climb the stairs several times a day. 3. Food. If possible, find out what they have been eating already so that you can get them used to your preferred brand by gradually mixing it in for a smoother transition. Vets will recommend a variety that includes dry food as well as some wet food as it is closer to their natural diet and provides additional hydration. Naturally you will want to make sure fresh water is always available. 4. Cat Bed. Having a cozy spot just for them is great since they enjoy their solitude for napping. I found a cool bed that was like a little cat yurt and they loved the security of hiding inside. I can’t deny their love of cardboard though so if you want to put a blanket inside a box they’ll probably enjoy it just the same. 5. Toys. Younger cats are naturally playful, but older cats might need encouragement to be active so you need to experiment with what is available. In general, lighter balls that they can pick up in their mouth are preferred and anything involving catnip. Teaser wands are a big hit at our place with strings and feathers and such. My guys like the rattling sounding balls better than the jingling ones. They will actually throw them down the stairs and retrieve them. Believe it or not, I found them playing a sort of fetch game running up the basement steps with the ball in their mouth and tossing it down again. It was adorable! Again, there is room to be creative with homemade things and don’t underestimate the amusement that can be found from a sliced up toilet paper core rolling by. 6. Cat Brush. The cat brush is your ally in the battle to keep shedding to a minimum and usually they come running for it. Get them used to it early on with short sessions and short gentle strokes. Longer haired cats can get matted so regular grooming and brushing is a wonderful way to help keep them comfortable and happy. 7. Dishes. I like having a couple sets of bowls for them so I can swap them out for cleaning. Wet food leaves a crusty residue and I like wiping their water dishes with a paper towel so it doesn’t get a slimy build-up. If I go away for the weekend, I bring out the autofill water bowl, but you can always just put an extra dish out for them, too. 8. Scratching Post. Cats instinctively want to wear down their claws by scratching so providing a scratching post as an alternative to the furniture is a good idea. We had a good laugh when I tried demonstrating how to use it for them. I don’t believe in declawing. It was popular in the past, but now that I am more informed, I think it is rather cruel and unnecessary. 9. Cat Toothbrush. Just like it is for us, oral hygiene is important for pets. Cats can be susceptible to periodontal disease as they age, but you can help prevent it from happening through regular brushing. Yes, it’s true, they make toothbrushes and toothpastes just for cats! Get them used to letting you look in their mouth and use a toothbrush while they are young. Go have some fun anticipating and gathering all your kitten supplies ahead of time so that you can relax and enjoy your new friend without stressing about your to-do list. Being prepared with these essentials will allow you to focus on bonding with your new cat/ kitten. Congrats and enjoy! What supplies did you find helpful when you brought home your new kitten?